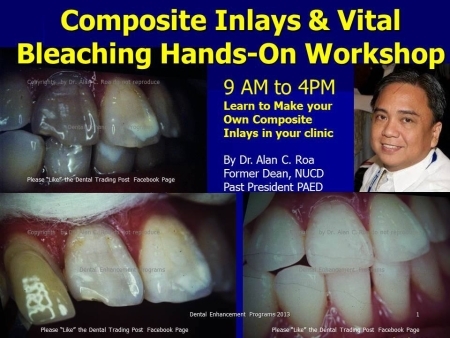 Learn how to make your own Composite Inlays, Onlays & Even Crowns. Find out also why a number of Bleaching Cases fail & get dark in 6 months rather than 2-4 years which is about our average whiteness. We start off training your hand to how its done, feed your mind with good ideas & body with very good food. Dental Enhancement Programs started in 1995 and is an Independent Program not run or controlled by Dental Companies with over 30 years of Clinical insight. We share our knowledge through the Dental Trading Post, Lectures but best with our Hands-On Workshops. Here we can see how you apply what you learned in the lectures. At Roa Dental Clinic at 9 Escaler St., Loyola Heights, QC. Fee is PHP 5,500 only including materials & very Good Food: Lasagna, Chicken Baked in Milk, French Onion Soup, Sticky Date Pudding with Butterscotch sauce., etc..